The funny photo by the actors of The Moon that Embraces the Sun exposed, provoking laughter. 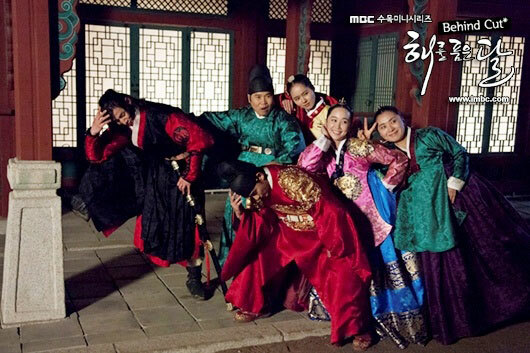 The official website of MBC Wednesday and Thursday TV series The Moon that Embraces the Sun published a behind cut photo of actors in funny pose, attracting attention. In the photo, Kim Soo Hyung and Song Jae Lim lowered their head, assumed the pose as if in trouble and deep thought, Kim Min Seo put her arm over the back of Kim Soo Hyun, revealing a bright smile, while Han Ga In leaned against the shoulder of Jung Eun Pyo, showing a look of playing around. Netizens commented on the photos, “After the shooting, the atmosphere is so cheerful ah,” “Sister Ga In, very scary,” “These actors are very humorous” and so on. The Moon that Embraces the Sun ends on March 15th, 2012.